Applications in the electronics industry ranging from sensor−based designs to power amplifiers are periodically faced with the requirement to generate a negative voltage rail. Although many transformer−based designs, charge pumps and other methods have been used to meet such a requirement, the inverting buck−boost topology stands out as simple to design and can save on power and board space too. With power budgets in many applications already stretched, and PCB real estate limited due to the high levels of functionality incorporated in many new products, power devices that use an inverting buck−boost topology can prove extremely valuable to systems designers. A Buck regulator can be reconfigured to generate a negative output voltage from a positive input voltage using the inverting buck−boost topology. Unlike a buck regulator, the Inverting buck−boost transfers energy to the output through the output diode during the ’Off’ time. For this reason, users must keep in mind that the average output current is always less than the average inductor current. Automotive environment can be quite harsh and designing electronics that need to work reliable in this environment takes special care, and often requires automotive qualified parts. 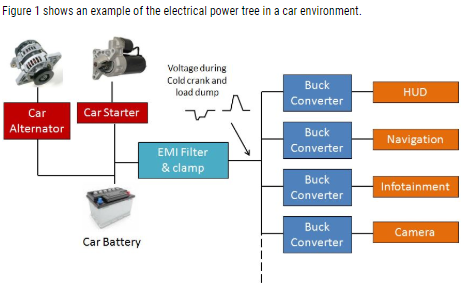 When designing voltage regulators that need to step down an intermediate voltage from the car battery supply, the car battery voltage fluctuation needs to be taken into regard. The full operating temperature range needs to be considered for all aspects of the design, and all component parameters have to be checked over temperature. The car radio receiver is nearby, which means that any switch-mode converter radiated emission needs to be minimized to avoid switch noise being coupled into the car radio receiver. We recently noticed a very cool-looking series of power supply modules on a few of the Chinese deal web sites. Depending on the model, they provide a digitally-controlled voltage with metering. You need to provide at least a volt or so over the maximum desired output voltage. You can see a video from [iforce2d] below. The module in the video is rated for 5A at 50V maximum, but there are other sizes available. For those interested in graphs and numbers [lgyte] did a lot of characterization of these modules. There was a time when importing goods from far away places was somewhat of an art. Finding suppliers, working out payment, shipping, and customs meant you had to know what you were doing. Today, you just surf the web, find what you want, pay with PayPal, and stuff shows up on your doorstep from all four corners of the globe. There is one problem, though. We see a lot of cool stuff from China and some of it is excellent, especially for the price. Frankly, though, some of it is junk. It is hard to tell which is which. What’s more is even though in theory you might be able to return something, usually the freight charges make that impractical. So when you get a dud, you are likely to just eat it and chalk it up to experience. So the question is: how good (or bad) or these power supply modules? The video is a good way to see what you are getting. Certainly, you get a better idea of the size of the module. However, what’s it look like electrically? The testing from [lgyte] is very comprehensive and not only includes graphs of key parameters but also IR photos of the circuit board to identify hot spots. There’s also a longer video about a similar module from [neutronstorm], below. For the low price, the features of these supplies look good. You can set the supply to shut down when you exceed a voltage, current, or power limit. The DPS series modules have a slightly improved user interface compared to the DP series. We’ve seen digital power supplies before (including some nicely packaged ones), of course. However, these are cheap, look good, and would be dead simple to use. A transformer, bridge rectifier, and filter capacitors on the input of one of these and you are set. For many applications, an old 18.5V laptop power brick would be a great way to feed one of these.